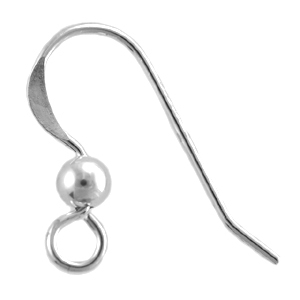 1/10 Silver-Filled French Hook Earwires, "flattened", with ball. These measure approximately 18mm (top to bottom), with a 3mm ball, and are 22ga (.025") thick. These are smaller that the silver-filled Earwires with 2.6mm ball - those are 25mm. Sold in packs of 20 (10 pair).